Hey there! I’m Balistafreak, the editor of Kuroinu, and in the next part of my editor’s corner, I’d like to talk about a particularly important aspect of story writing: names. It should go without saying that names are vitally important to how a story’s setting presents itself to its readers. A story set in the real world (that is to say, on this planet Earth) needs to use names appropriate to the country and region for the sake of verisimilitude. For example, it would be extremely bizarre for a story set at a Japanese high school to have all its characters bearing decidedly non-Japanese names along the lines of Jill, Olaf, Fatima, or Vladimir. Conversely, if a story’s protagonists all have names like Tanaka, Akiho, Yuki, and Yamashiro, the expectation is for them all to be Japanese. It would be a rude shock if they all turned out to be as perfectly cookie-cutter multi ethnic as the cast of Captain Planet or something. Fantasy settings like Kuroinu’s mix up the equation of “race and region,” of course, but the regional origins of names create expectations in the reader. In stories with a limited scope or small cast, it can be excusable if Bob rubs shoulders with Aerith, so to speak. But when a story specifically brings together characters from a myriad of varying cultures, we as readers expect them to have names originating from a similarly diverse spread of real world regions. The writer of Kuroinu did not disappoint me in this aspect. Each of the Seven Fortresses draws its garrison from a different country on the continent of Ostia (and the Black Citadel, the aberrants of Legion). To reflect this fact, the names of the heroines at each of these locations have similarly varying origins. Olga, meet Olga. May you both rest in peace. I’ll start with the woman who’s arguably the most recognizable of the cast, and the first heroine you’ll likely encounter in game. 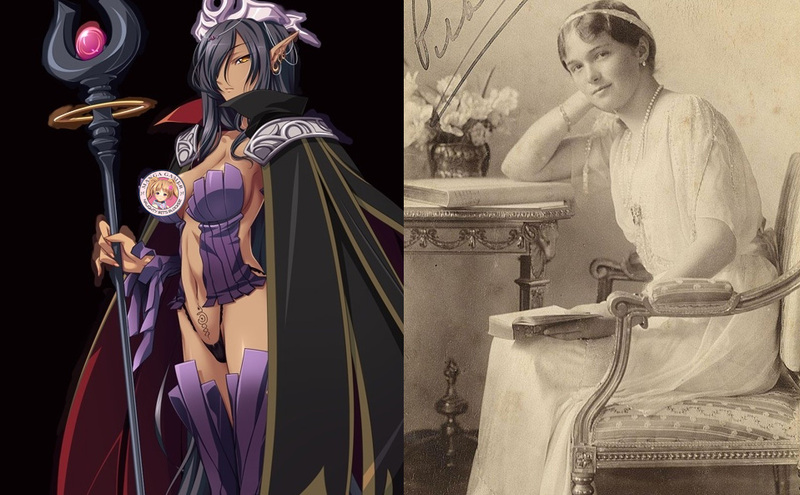 The name of the prideful dark elf queen, Olga, is most famously found our world’s history books as the name of the Grand Duchess of Russia for five entire generations in the 19th century. The last of them, Olga Nikolaevna, was arrested, imprisoned, and murdered in the events of the Russian Revolution of 1917, and while the dark elf Olga avoids death after being similarly deposed from her throne, I think it’s fair to argue that being turned into a cumdump of the Cuntry is worse. The writer’s thought process behind picking out Olga’s name is pretty clear: the two women are both forcibly removed from their privileged positions of power. The religious leader of the Seven Shields Alliance has a similarly appropriate name, but hers is of French origin. Celestine derives from the Latin “caelestis,” meaning “heavenly,” a perfect match for the angelic, peaceable high elf. Both Olga and Celestine have appropriate names, but the origins of each of their names are as different as – well, a dark elf and high elf. And the same care is found in everyone else: the knightly Claudia, the halfling Lulu, the serene priestess Kaguya… the heroines’ names are just as diverse as their character backgrounds, fleshing out the setting and giving the continent of Ostia a remarkably authentic feel. However, when it came to the name of the game’s main male lead, I was faced with a daunting problem. Tune in next time for my final post, when I’ll explain just what it was and how I came up with a great solution to it. 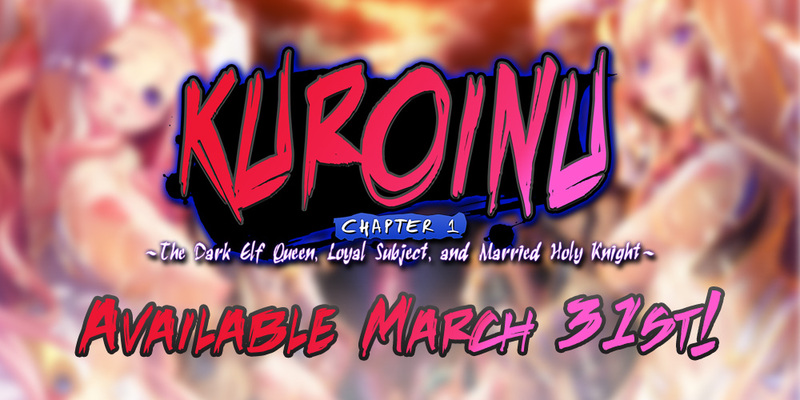 Kuroinu Chapter 1 is now available for pre-order! On sale March 31st! Pre-order today to get your copy for 10% off! Tagged Chapter 1, Kuroinu, Liquid. I’m genuinely surprised and pleased with some of the translation choices here, particularly with Olga’s name. The non-licensed, unofficial fansubs for the OVA adaptations translated her name as “Origa”, which given her full name (“Origa Discordia”) sounds like generic faux-fantasy stuff. “Olga” sounds sounds more mundane at first, but then you realize it sounds like a genuine name. I like it. If the OVAs ever get licensed, I hope it’s the name they go with. Also, I’m so amused by how Olga’s default, fully-clothed pose needs to be covered up. Thaaaat’s dark elves for ya~!